The Quilting Edge: A Clean Dress....Really???!!! We've come a long way, baby. One of my sewing buddies saw fit to put this on facebook today. I just had to share it with you. As it was our quilting day today, they actually had to the audacity to suggest my house be spotless, before they arrived and they expected to find me in a clean dress. Hmm....do I even own a dress. Never mind, this set the tone for the day and we did more laughing than quilting today. As I read it to my husband he said "EXACTLY!....oh, to live in that time!!" My response to him was....oh never mind, you can imagine my response. 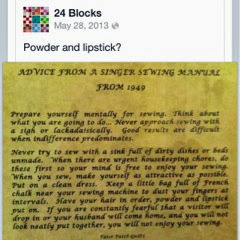 I had a very old household tips book that suggested similar personal preparation in readiness for husband returning, worn out, from a day at work!! More laughing is always a good thing! So is progress for women! Thanks for sharing. interesting social commentary, isn't it. I've seen this before and it still puzzles me. I sew in a ratty old fleece jacket covered in threads, to protect the rest of my clothes from looking the same. LOL! I am thankful every day that I live in 2014 and not back then! Ridiculous! Hehehehe! I can just imagine what my hubby would say if he came home and saw me dressed like that. He'd probably call an ambulance. almost as barbaric as my boss saying..... "his mom used to always say women should always keep themselves presentable"
my sewing machine doesn't know the difference whether i'm in my PJ's or my dress!! !